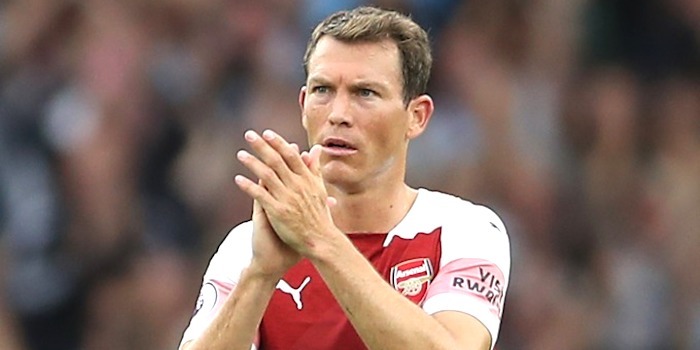 Stephan Lichtsteiner is away on international duty, and spoke to Swiss newspaper ‘NZZ Neue Zürcher Zeitung‘ about how things are going for him at Arsenal, and what the future might hold. Arseblog News reader Florian has provided us with a translation, so thanks very much to him, and here’s what the veteran had to say. You are 35 years old. Are you feeling your body? Barely. I’m feeling good. Not bad at 35 years, right? I want to set new boundaries. Always achieve new goals. After the first Italian championship I wanted the second. After the sixth one the seventh one. After the first Champions League final I wanted the second one. After the 80th international cap the 100th. I have been asked many times whether I will finish my career on the peak. But what’s the peak in a successful career? My challenge is: It’s always going onward. Until at some point it’s not possible anymore. For me retiring has never been an option. I have high goals, and I like challenges. That’s why I signed for Arsenal in the summer. My family and I were doing wonderfully in Turin, we were almost Italians. But I noticed that I wanted to break out of the comfort zone once again. I want to continue to prove myself. You said lately that you’ve come to terms with playing less at Arsenal. Yes, I’m 35 years old, I need a bit more recovery time. I’m not mad if I’m not starting. And yes, I’m in a good position. I’ve had a top career. I’m calm, and I’m enjoying it. You are playing sporadically at Arsenal. Is this altering your status in the national team? I don‘t think so. Arsenal is a top club. It’s obviously more difficult there to play every time. I’ve come to a new country, a new club. I’ve had to get to know a new culture, new people, a new league, new tactics. That needs time. The fact that I’m playing at a top club at 35 years says enough. How different are the English and the Italian leagues? The difference is big. In Italy the tactical level is higher. On the other hand in England the rhythm is incredibly rapid. There are six absolute top teams and then seven more very good sides with a lot of great players. What are you going to do once your career has finished? I don’t know. I have a couple of ideas. It could be coaching, but it’s all open. What I do know is that I’m going to switch off for a while. Gain distance. Do things that I could never do in the past years. Ski with the kids, go on vacation for longer and more often. How are you doing in London? Good thus far. We are anxious what will happen with Brexit. Maybe they will kick us out of the country tomorrow! Seriously: It’s all good. Turin was great. In one hour you were in the mountains, in one and a half hours at the sea, in two hours in Switzerland. Now it’s all more difficult, but we are feeling well. The kids are already speaking English perfectly. For how long will you be able to continue playing? I don’t know. In my age and at this level the strength does not decrease slowly anymore but rapidly. Of course I could go to America or somewhere where the level is lower. But my desire is to play against the best. What I do know: I don’t want to move my home three times. Will you extend your contract at Arsenal? There were talks. We will have to see if it fits both sides. Arsenal are a big club, I’m feeling very well, but with regards to the European Championship I want to play regularly. This year it’s been okay. However, if the coach says that he does not count on me anymore, I will have to think. No matter what happens in the future, I’ll always remember him fondly for going after Eric Dier in the North London Derby! A mature and rational response. He seems like he would make good coach material. Vastly experienced but not afraid to show emotion and grit where necessary. Perhaps a Swiss Steve Bould-esque type player to coach transition is on the cards for him. I like this guy and his attitude ,mainly off field and I think the premiership may be a bit to physically challenging for him , but he has had a few good games as well. But honestly Stephan is this your first 35 Birthday ? Congrats on replacing Wenger as the biggest has-been at the club. Be sure to say hello to to him once you’re also booted out the door. Your mother never taught you manners? Shame to talk about him and Wenger that way. They’ve done a lot more for the club than you could ever have in your lifetime. Jeez. Utterly unnecessary comment on an article that provides real insight into an athlete who’s clearly got the hunger to keep playing at the highest level at an age when he could quite respectably retire. I get that we’re fans and we see everything through an Arsenal lens, but to be so dismissive of him after an interview where he’s acknowledging the difficulties he’s facing and outlining how he’s trying to overcome them is such a pointless and downright rude thing to do. Football would be no fun if all our players were superhumans. They’ve got limitations and we hope they can overcome them. It’s the essence of being a football supporter. when we were linked to him, on paper he ticked every box, aggressive, ball winner, leader, all of which we were lacking yet watching vid highlights of players can be misleading but can still give an essence of what type of player it was probably the most underwelming ive ever seen, i thought the guy that cut his highlight profile done him a disservice, along come the WC and again i was looking out for this top player coming our way to see a couple of shouty appearances blaming opponents/ref/lino for all of his mistakes. the jurys not out with this guy with me, he must of done something right in Italy yet their league when he was winning titles was at its lowest level, even their international side couldnt make WC/EC , can only think he got carried with some proper Italian defenders, some players are lucky in life, picking up contracts and titles when they had a top keeper behind them and top players along side them, i get shudders when his name is on the bench let alone in the 1st team, opposite teams know what side of pitch to attack when he’s on as he’s so poor, i do respect his attitude and maybe his professionalism is having an effect on some of the players in the team and i have nothing personally against him but he isnt good enough for us. You need to be made into an ex-human being. Fairly honest interview- he’s well aware of his limitations (nobody would have won as much as him without being so) but clearly determined to still be the best he can be. He’s been a body with experience of winning things and bringing a bit of sh*thousery to the team…if that is his only legacy to the team, I’ll take that! I don’t understand why people are critical of his signing. It’s one year, not like we’re stuck with him for years & stuck with his salary unable to sell him like happened with many others. Simply a good signing, no argument. This guy should not play in the first team again. He’s simply not quick enough and other teams target him. He’s been found out and is a liability when he plays. I can’t believe there’s even a slight possibility of him being offered a new contract.